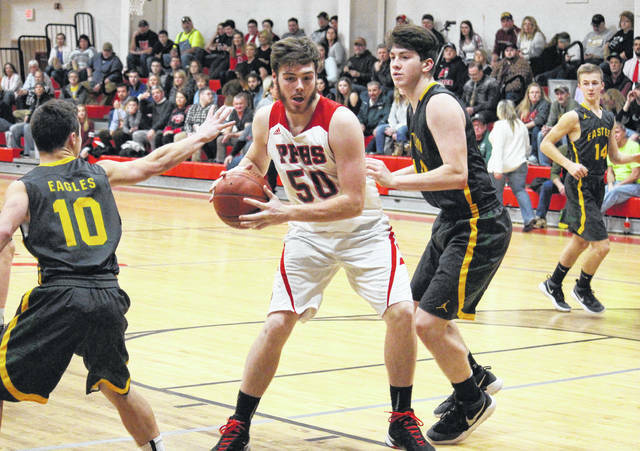 PPHS senior Trace Derenberger (50) drives between Eagles Sharp Facemyer (10) and Kaleb Hill during a non-conference game on Jan. 23 in Point Pleasant, W.Va.
PARKERSBURG, W.Va. — Point Pleasant senior Trace Derenberger will represent the Big Blacks in the 17th Annual Battle Against Cystic Fibrosis Basketball Classic, on March 30 at Parkersburg South High School. The Ohio versus West Virginia all-star games will begin with a girls matchup at 5:30, with the boys game following at 7:30. Derenberger averaged 7.5 points and 8.0 rebounds per game for the 3-19 Big Blacks this winter. Joining Derenberger on the West Virginia boys team — which will be coached by Ravenswood’s Mick Price — are Cole Plants, Kerwyn Marshall and Shane Snider from Parkersburg South, Jayden Rhodes, Isaiah Morgan and Stephen Dawson from Ravenswood, Justin Phillips, Alex Cook and Matthew Cook from George Washington, Seth Dailey and Parker Miller from Parkersburg, Chase Sullivan of Ritchie County, Trenton Burdette of Wirt County, and Dylan Roberts of Tyler Consolidated. The Ohio boys team will be coached by River’s Mark Romick and features Lukas Isaly and Cody Hupp from River, Jake Speakman and Naylan Yates from Vinton County, Josh Huffman and Troy Huck from Warren, Anthony Avendano pf Marietta, Carson Starlin of Miller, Dalton Cozart of Athens, Randy Hixson of Trimble, Shon Howell of Frontier, Travis Pottmeyer of Waterford, Trey Singleton of Meadowbrook, and Ty Staten of Fairland. On the West Virginia girls team — coached by Ed Davis of Parkersburg South — are Devin Hefner, Allie Taylor and Allyssa Wilson from PSHS, Hanna McClung and Lauren Bennett from Buckhannon-Upshur, Lexi Miller of Ripley, Cassie Tallman of Ritchie County, Bayley Wellings of Gilmer County, Amanda Reynolds of Tyler Consolidated, Ali Westenhaver of Ravenswood, Bethany Wager of Williamstown, Jaden McDaniels of St. Albans, Lucille Westfall of Roane, County and Mary Rogoszewski of Hurricane. Led by Waterford head coach Jerry Close, the Ohio girls team will feature Alli Kern, Megan Ball, Hayley Duff and Hannah Duff from Waterford, Peyton Bowe, Kate Liston and Emily Jackson from Warren, Emily Chapman and Taylar Wilson from Fairland, Julia Griffith of Caldwell, Charlie Endly of Cambridge, Kylie Daughery of Frontier and Camy Wiggins of Meadowbrook.